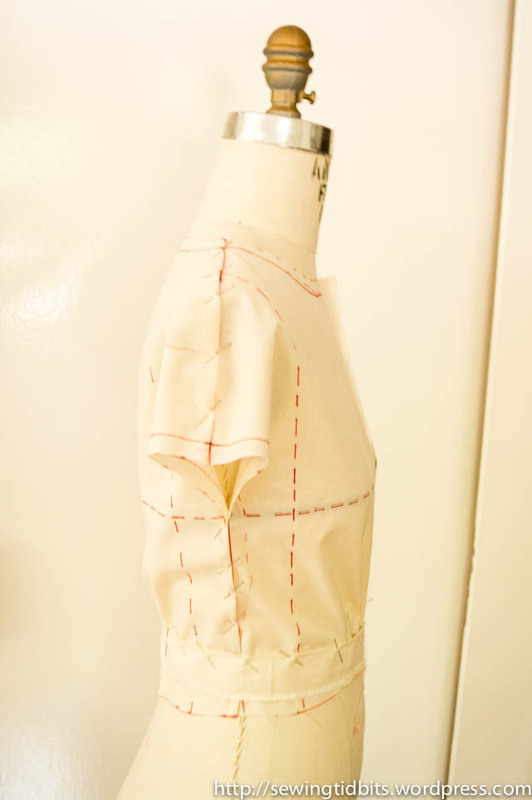 As stated before, some Vogue patterns include a slip which is meant to be cut on the bias. Carolyn of Handmade by Carolyn made a beautiful version. I myself own New Look 6244 but it’s at my parents’ house… in France… I actually made this dress 10 years ago but purposefully ignore the bias for the lining (so stubborn) because I did not see the point. Ahem Ahem… I have to admit that in my early sewing years, I was (still am) very stubborn and I did not see the point of many things . 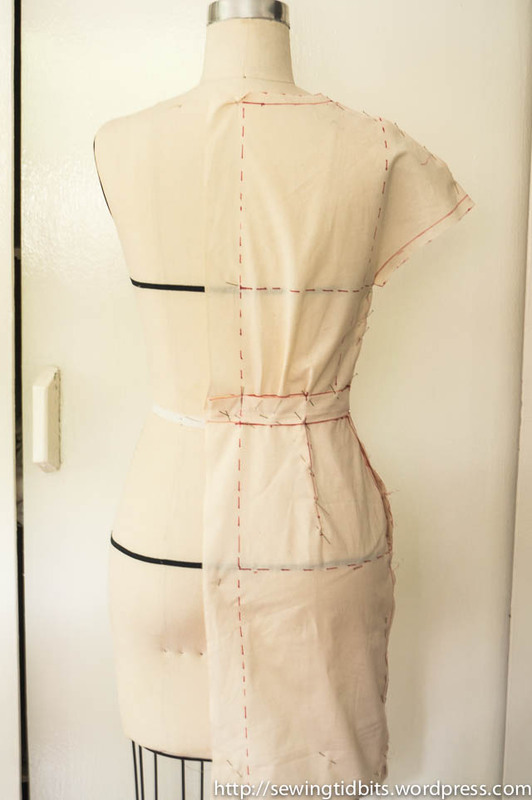 Those things included seam finishes, easing sleeves, aligning the grain, wearing ease and many more… Slowly but surely I integrated them in my sewing for the better! One detail, I dislike in current Vogue slips such as 1287 is the bust dart. I was convinced I could get away without one since the bias could do the minimal shaping I require. I finally decided to go with the lining of Lekala 2021. It doesn’t not specify that it’s meant to be cut on the bias, (at least Google Translate does not say so) but since I got to start with a pattern customized to my measurement, so I figured it was worth it. 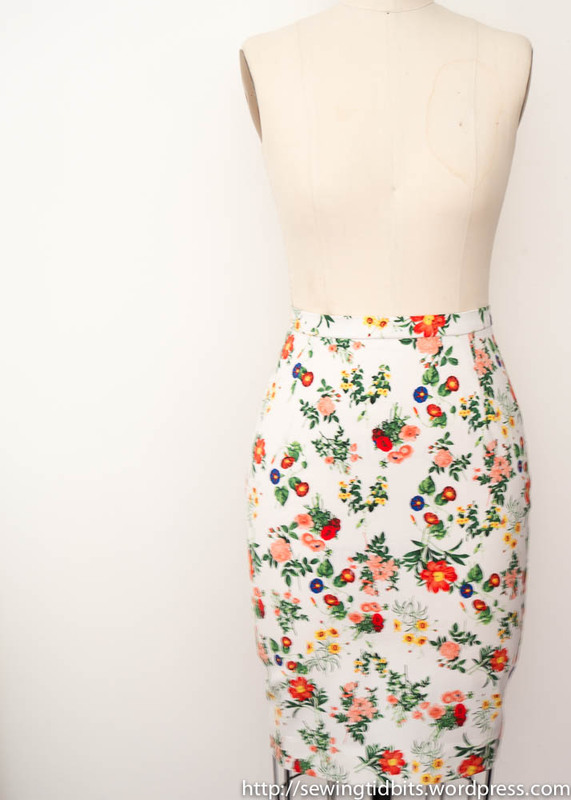 My first step was to do a toile. I used regular muslin even though my silk was going to be behave differently. I figured a “skin” tight fit on my form (slightly bigger than me) in muslin would result in appropriate amount in and the 2 layers of silk would have appropriate wearing ease on me. It was a bit risky but it worked! 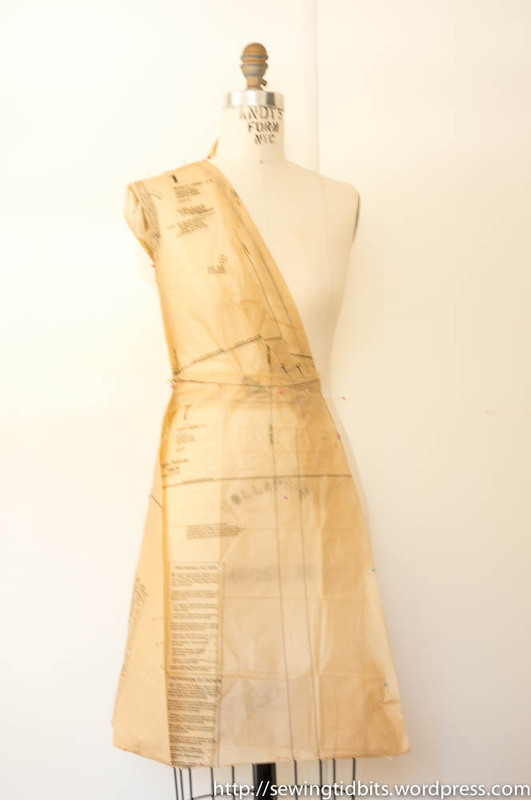 I also used the toile to check the neckline and position and measure the straps. 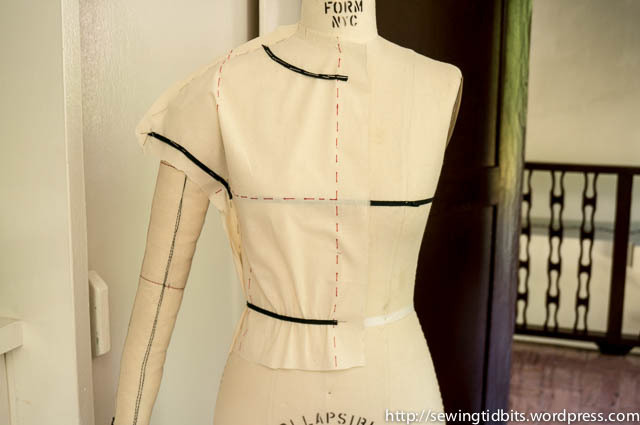 I had to take in 1/2″ from each side at the bust and waist, tapering to nothing at the hips and I made no changes to the neckline. The most challenging part for me in working with with silk is cutting, especially on the bias. It takes forever and I’m always tempted to cut corners. However, this time I did not. I lied my 23mm silk crepe from Calamo New York on a first layer of paper, aligning the selvage with the straight edge of the paper to prevent distortion. I created a “marker”, which is another layer of paper with all the pieces to be cut drawn in their cutting position. I added my “marker” on top and pinned between the pieces to avoid marking the silk. I then cut through the 3 layers. I have an important piece of information that some of you may resist. It’s OK to cut through paper with your fabric scissors! 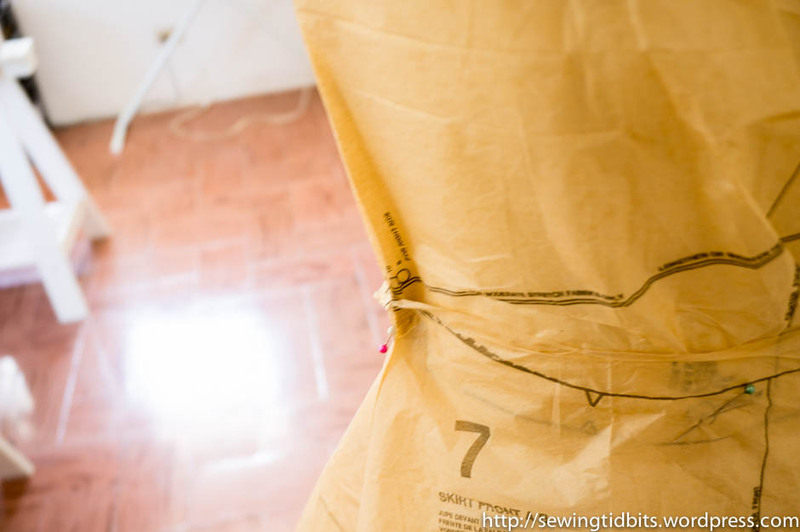 Yes… I know what the home sewing police says but really, you’ll be fine! And it will actually dull your blades a lot less than cutting wool or tweed!! I stabilized both layers of the neckline with fusible strips and attached the sides with french seams. For a reason I cannot explain, sewing went well for the first pass of the french seam but my industrial Juki refused, yes refused (!! ), to go through the second one with a repeated mess of skipped stitches. I was confused and about to cry but I decided to add a layer of paper on top of the seam and tear it off after stitching and it did the trick! For the straps I used the method described by my friend E. on her blog. The only thing I would add would be to not be afraid to use a rather large strip of bias, such as 2.5 or 3″ as the allowance will “fill” the tube. For the hem, on top of providing the tutorial, E. gifted my ban-roll. I don’t know why I never tried before. Actually I do know why (see stubborness mentionned above) but I regret it deeply. This thing is absolutely AMAZING: perfect baby hem on silk. Every. Time. No need to say more. I actually want to try it to hem shirts with it too! That’s it for my notes. I love love love the final dress and I wore it for my birthday (30… yikes). We went dining and dancing and I felt very comfortable in this simple yet dressed-up silhouette. 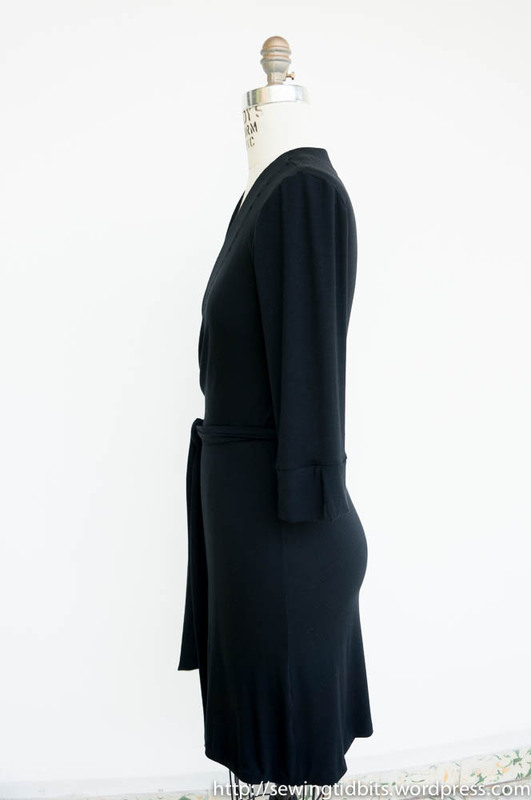 I am now thinking of making a single layer one out of thicker black silk crepe. And tank tops, a lot of tank tops, I may have opened the pandora box of bias project! 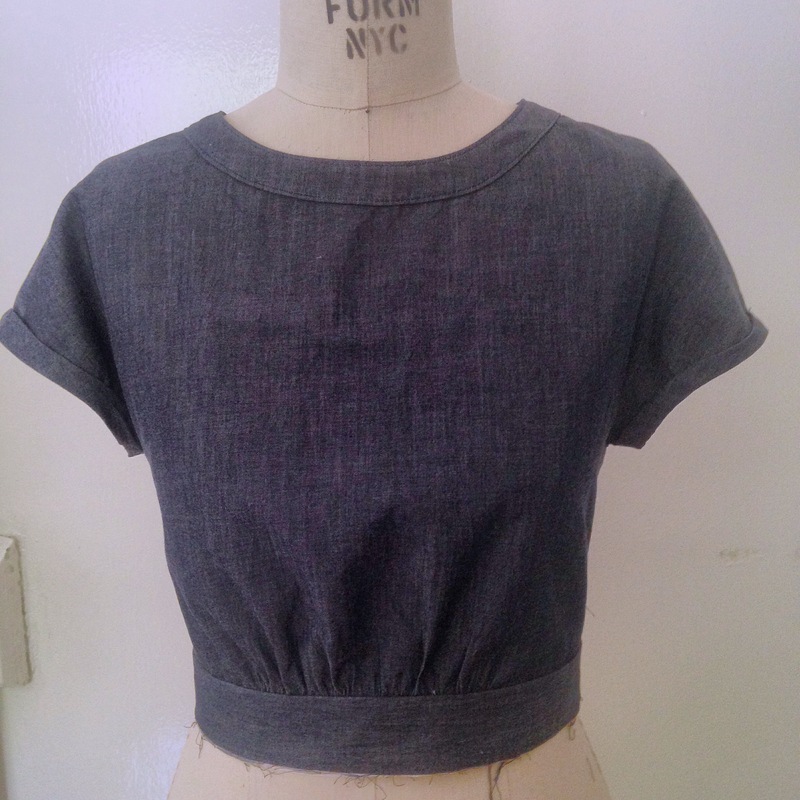 Do you have favorite patterns for bias cuts ? I would love to see what you recommend! Canadian weather seems to make me lazy, and since I’m not a very prolific blogger already, it’s getting sad around here. But here I am! 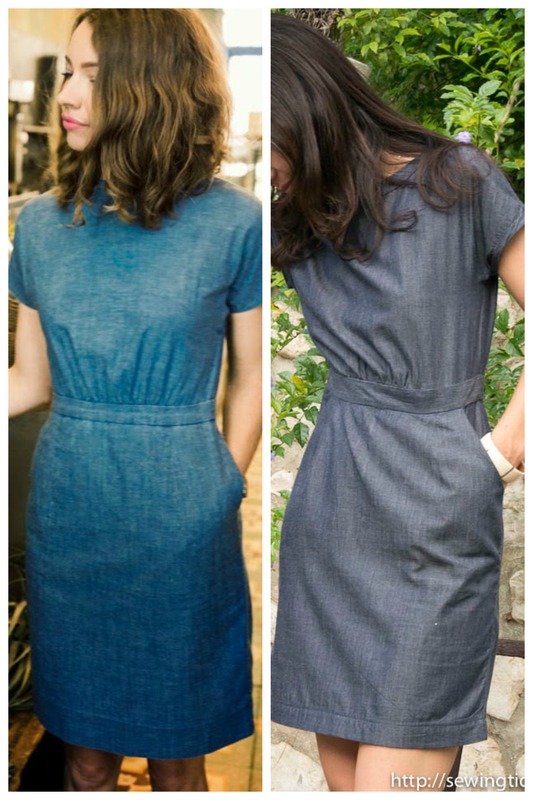 As promised, I have pictures to show you of the finished chambray dress I draped in my previous post. 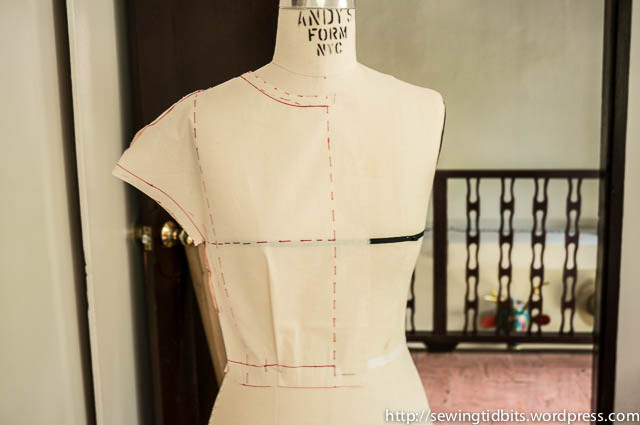 I mentioned before that sewing your own patterns is completely different experience than sewing commercial patterns. Since you don’t have instructions it may seem counterintuitive, but it’s much easier. Steps just flow naturally. 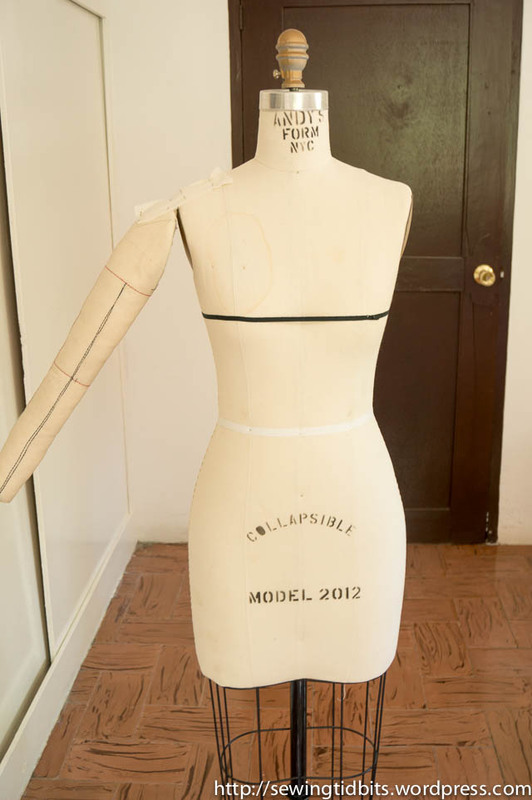 Of course you have to figure out a lot of things, but hopefully you did that in the patternmaking stage! If you remember the original dress, it had a kind of funnel collar, which I don’t find attractive. Instead, I decided to do a “visible facing”. There may be a real name for that but I don’t know. 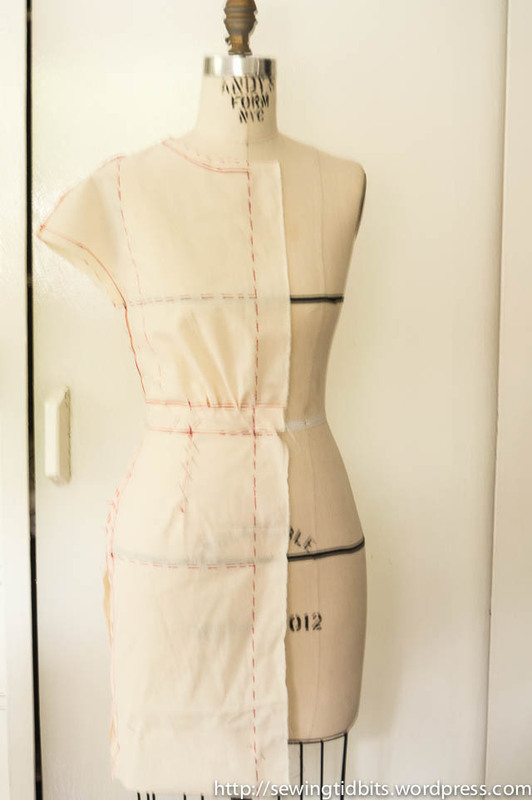 I stole the idea from my new favorite sewing book: Sewing for Fashion Designers by Anette Fischer. I plan on doing a book review of it because I am truly impressed by it. Considering the number of sewing books I read, this is quite exceptional. If you saw this dress on my instagram, you may have thought that I was very fitted but in fact it’s not. 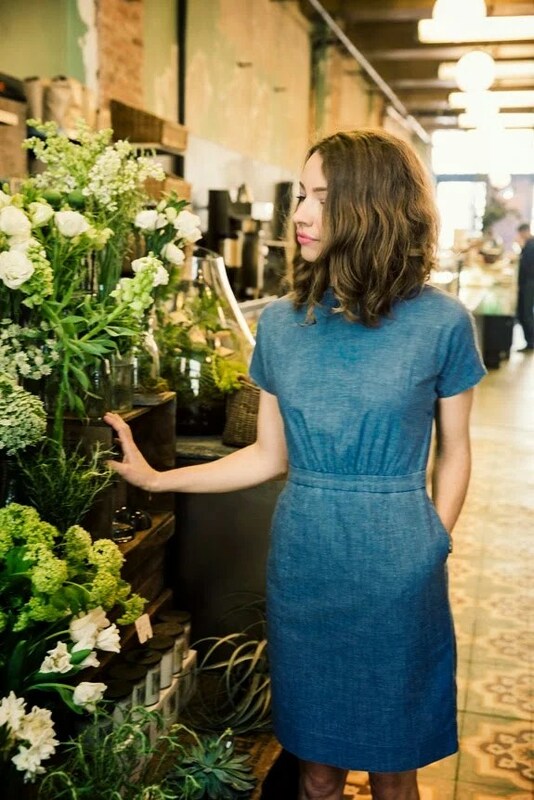 I love how comfortable it is, the style is relaxed and it makes it a perfect weekend dress! The fabric is from Rag&Bone, purchased at Mood during my last trip to New York. It does wrinkle and the sleeve style tends to accentuate the wrinkling but It doesn’t bother me for a relaxed dress. I used some of of my muslin for my pocket bags, I always think muslin is the perfect match for denim and chambray and it feels less wasteful about the whole process. I didn’t make my pocket bags deep enough for my taste, which is a recurrent issue. I always eyeball it and it’s systematically to shallow. I wonder if there is a rule of thumb out there… Any hint? 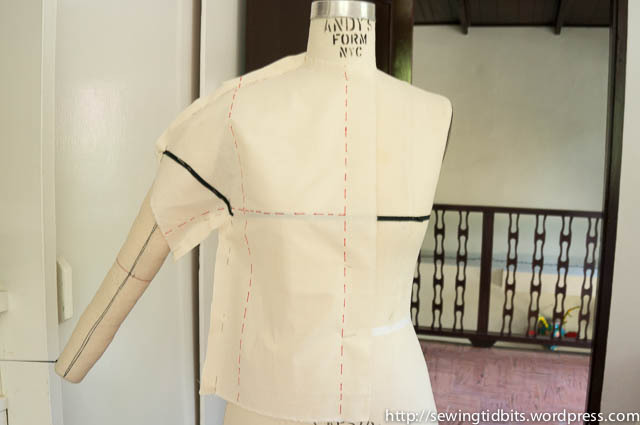 I love the upper body fit and I may iterate from this style and see what I can turn it into. I’m currently thinking and tunic/dress length without waistband of gathers to be worn with a belt. It looks clean and simple in my head and if I could sketch I would share with you. But my drawing skills are … let’s say limited (understatement…) so I guess you will have to take my word for it! I’m trying to turn those posts in a little serie that i call “From Inspiration to Garment”. Now that I wrote it, I may lose all my interest in doing it (yes…). 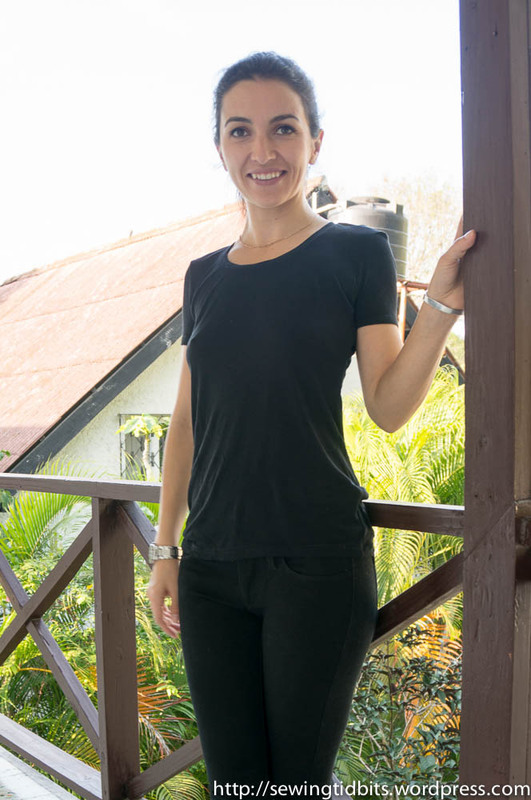 But in case I don’t, I like the idea of exploring different ways to draw from inspiration to make an aspirational wardrobe materialize and work in real life. Next post will be unrelated (it’s a leather one) but I will get back into it shortly! In the mean time, I leave you with a side by side comparison picture, do you think it looks close enough (except for the bad pose)? 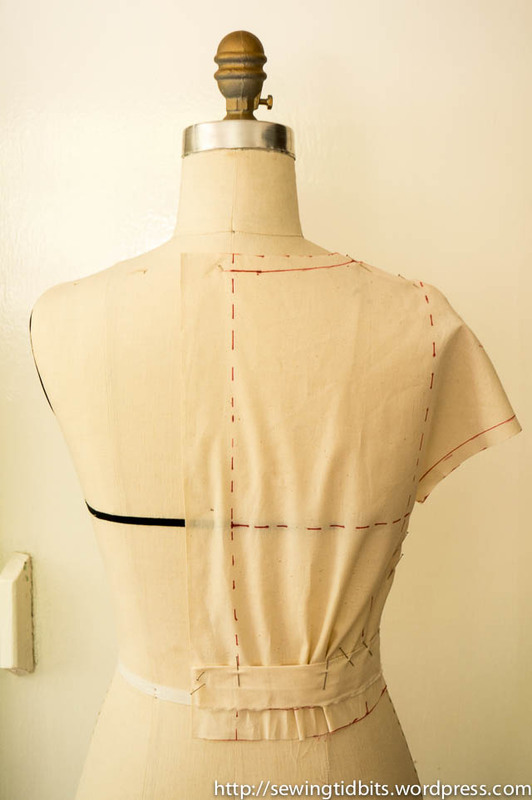 I’d love to here your approach to sewing from inspiration! I think I wrote several time about how rarely I work with Big4 patterns and why. I will NOT use 5/8″ seam allowances on a knit. Reading the instructions, I realized there was ease in the cap sleeve. Ease in a t-shirt sleeve!! 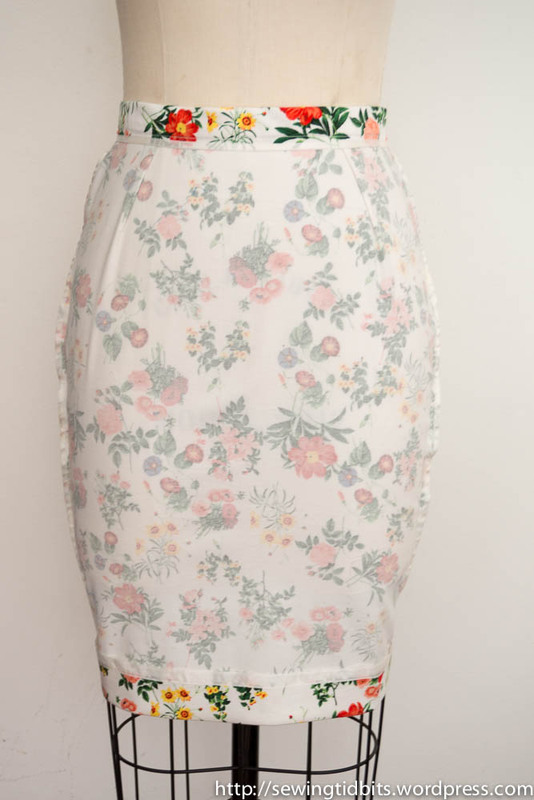 I also checked the many many PR reviews and saw that the skirt is considered very full. 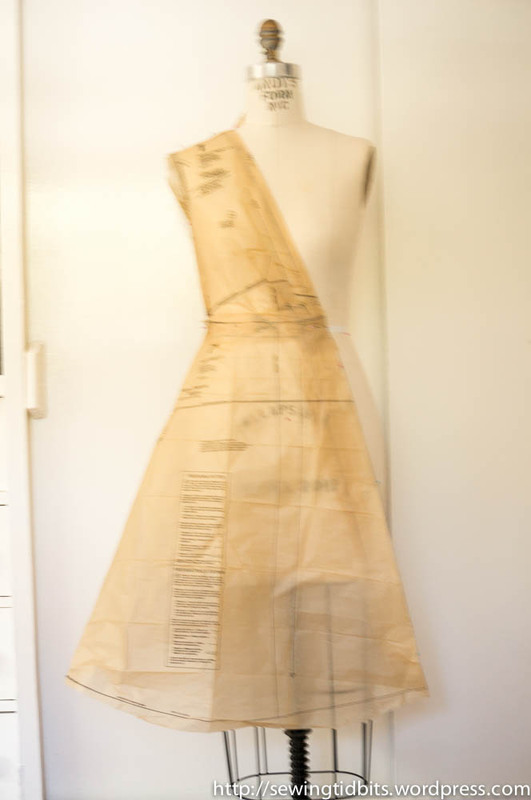 I draped size 8 on my form with the paper pattern. The picture is blurry but you can see how different it looks from the illustration. I decided to redraw the side seam and remove a lot of length. 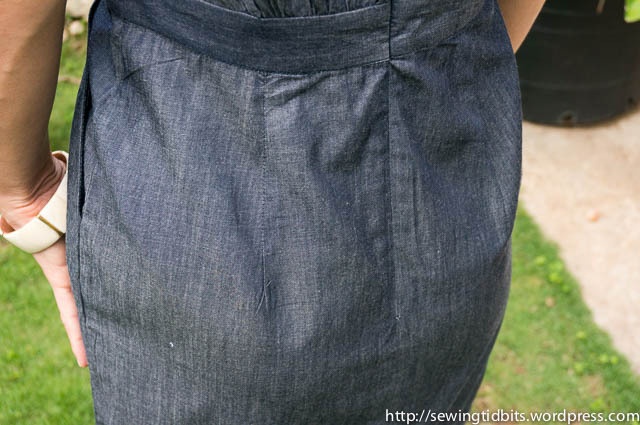 The final skirt length is 20″ and the hem circumference is 74″. I was surprised to find the waistline hitting at the right spot. I assume that it should be lengthen for none petite bodies. Other than that, the bust measurement is quite high, do they believe bust level is where the circled cross is??? I removed 1/4 where the point of the wrap at the bodice meets the waistline to prevent gaping and changed all the SA’s to 3/8″. 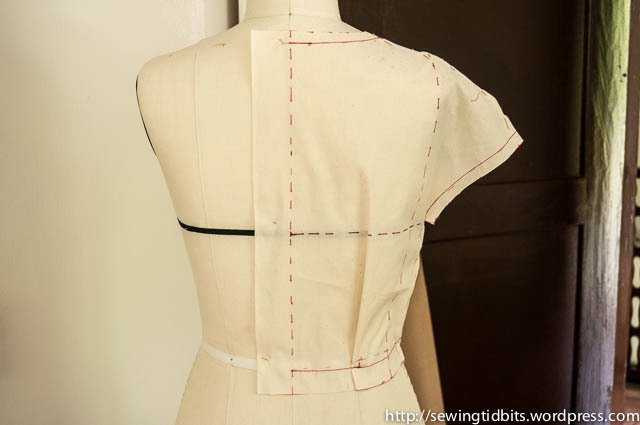 I removed 1/4″ on each side seam of the bodice, thus a 1″ overall. I found around 1″ of ease in the sleeve cap. 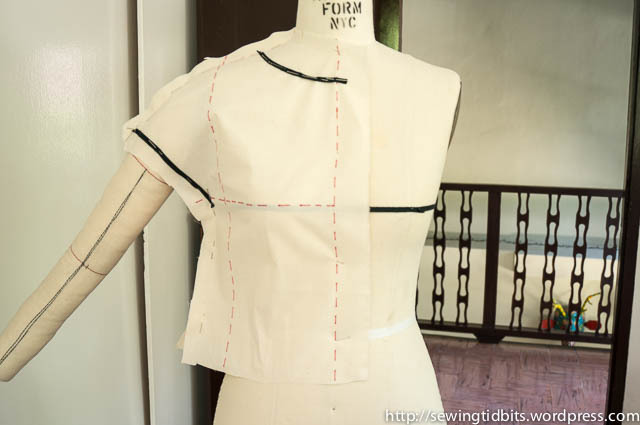 To remove it, I lowered the cap by 3/8″flatten the back portion and remove about 1/2″ on each side of the underarm seam (1/4″ being due to my intake in the bodice side seam). 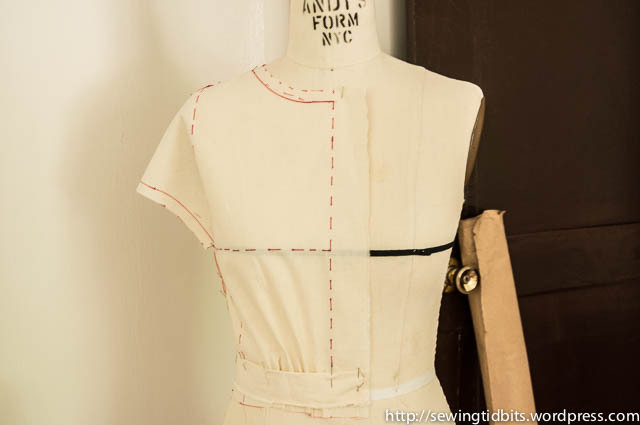 The dress was sewn entirely on the serger and what took the most time was probably finding the motivation of catch stitching the facing and the hem. The good parts in my procrastination is that with 2 weeks on the form, the skirt had all the times it needed to stretch out so I could safely mark and hem without risking further stretching. I only did a passable job at making my catch stitching invisible and it bothers me a little. But definitely not enough to redo it! The fabric is the last piece of a black jersey which at this stage I’m not entirely sure I bought it in Paris or in NYC. I get very worried about my memory. 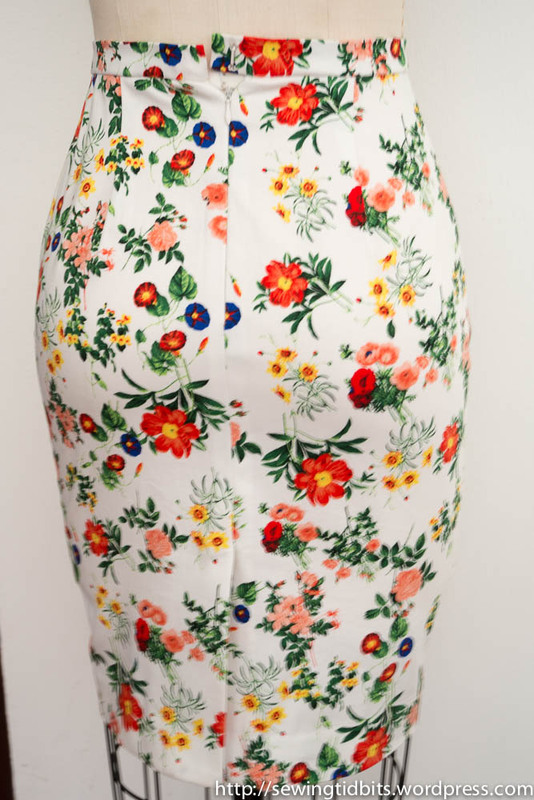 When I hear other seamstresses with stashes 20 times the size of mine (yes, it’s small), saying that they can remember buying each piece, I’m embarrassed. My entire stash holds in one drawer and although I think I know everything I own and could mention it from the top of my head, I get surprises every time! Am I the only one? Is my memory particularly bad? I didn’t like spending all this time on the pattern of what I consider a relatively basic knit dress. If you add my low sew-jo and The Old Man’s not-so-subtle-comments about spending time on dresses when I mostly wear jeans & shirts, I was about the quit several times. Even when I finished it, I was disappointed. I was planning a pathetic blog post about how I AGAIN sewed something I don’t need and how The Old Man was right. But last week I had a work cocktail and it ended up being very useful. I got a lot of compliments, including from The Old Man. What about you? 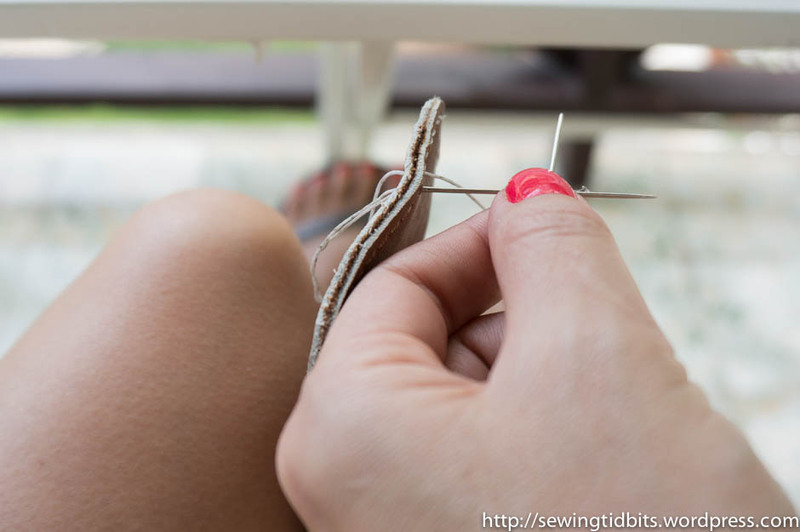 How do you decide what to sew? It’s already in April and I am completely ignoring my only commitment for this year : to post twice more than in 2014 – 46 times. As a wannabe M&E expert, I have tell you we are NOT on track to meet the target! I have been sewing, but since it’s 5 black or white t-shirts and a knit wrap dress, my excitement to take pictures and write about them is pretty low. On the other hand, I got something in the mail last thursday and it’s A LOT more exciting!! 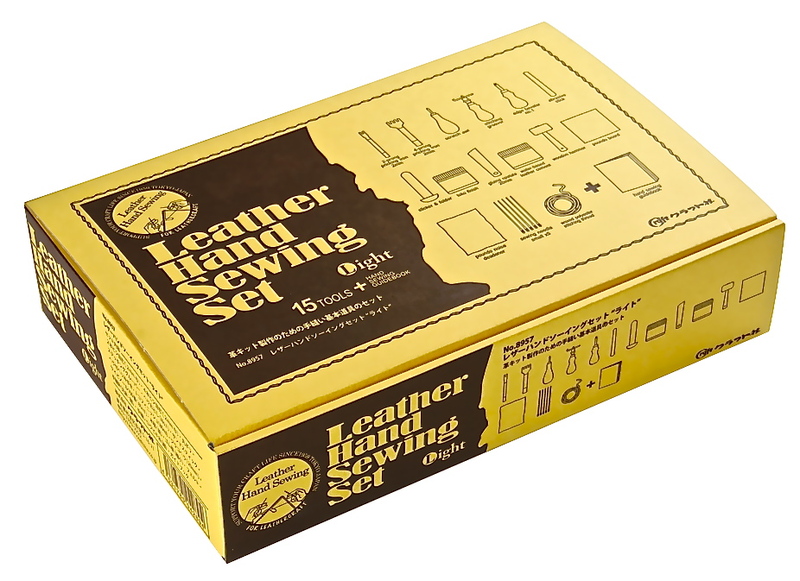 It’s CraftSha Leather Light Hand Sewing Set and it’s pretty amazing, because 1/ I ordered it from Japan (GoodsJapan, in case you are interested) and 2/ it came in the mail. IN THE MAIL! You may know that there is no mail in Haiti… I’m not entirely sure how it all happened but I don’t care, it is soooo nice!! I also bought a very fancy knife, specially made for left-handed people, which makes me feel like a leather samurai!! 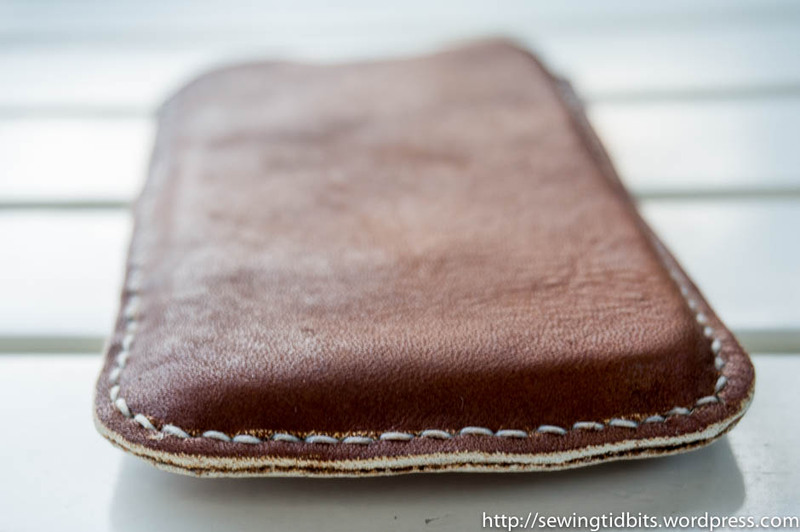 Of course I had to start right away and The Old Man very conveniently lost the previous leather phone case I had made him, and the one before that was eaten/destroyed/buried in the garden by our dog (yes, adorable but evil). 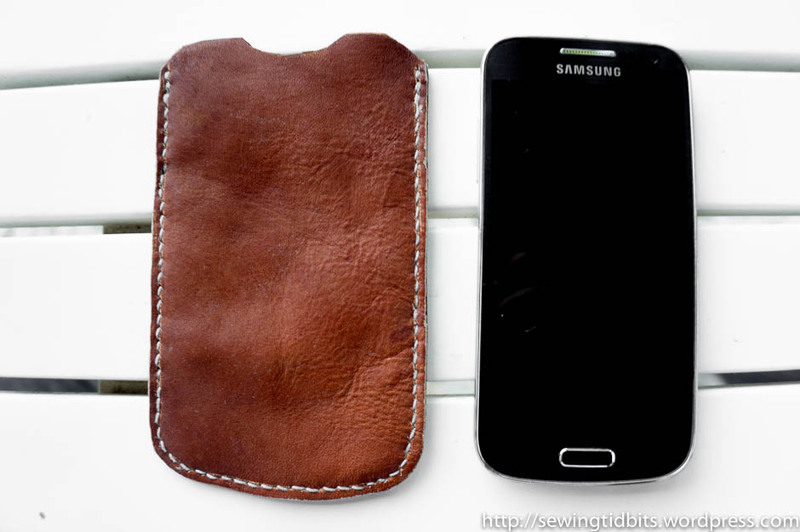 As the third iteration of the same pattern I made for his phone (Samsung Galaxy S4, I think), it is a lot more special because it’s hand sewn (the others were ruthlessly thrown under the machine) with Japanese tools. The set comes with a little booklet (in Japanese) for a basic project. I am very partial when it comes to all things Japanese and this is no exception. The pictures are very clear so you can follow along without understanding a single sign. I always wonder how much I would learn if I could read Japanese instructions. Their diagrams are so informative already, I cannot help but think what is written must be mind blowing (like, this adjustable uniform shared by Very Purple Person). 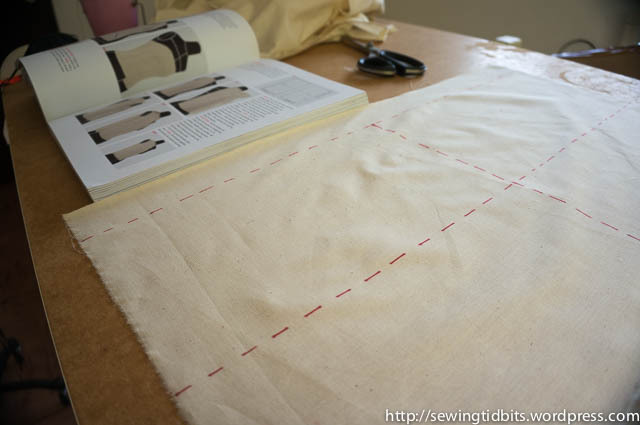 Hand sewing requires regular tension and not too much of it, the stitches tend look better a little looser. The leather is a from a skin The Old Man bought years ago in Colombia. 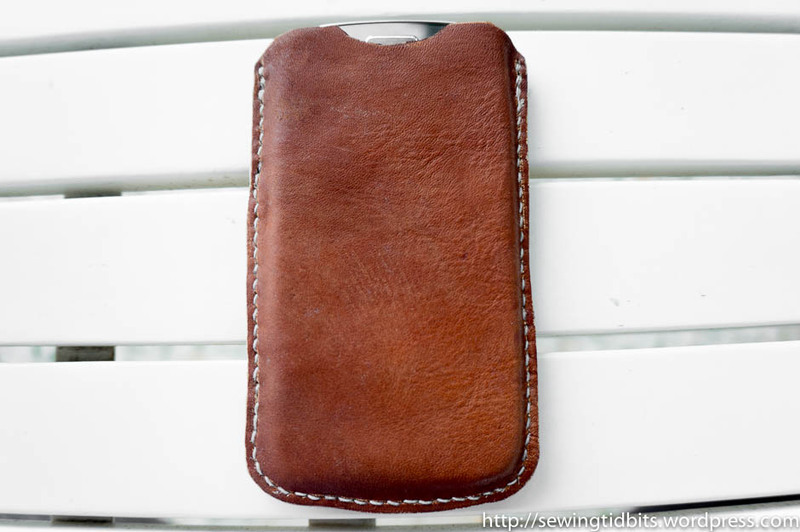 It’s softer than the vegetable tanned leather used in the booklet and dyed (but only the upper layer) so that also made a difference on how it reacted to the tools. It’s not my first time working with leather, I’ve made handbags, wallets and garments by machine, using a teflon foot and a special needle. Lately, I started to find the results disappointing since I don’t own a machine that would handle the thickness well. My industrial hates it, the feed dogs leave marks on the skin and it skips stitches. The home machine does a slightly better job but topstitching is very unpredictable. So hand sewing seems to be a good solution for small projects. That’s it, the case is not perfect but I’m reasonably happy with it as a first project. I can’t wait to experiment more, maybe with a clutch for myself. 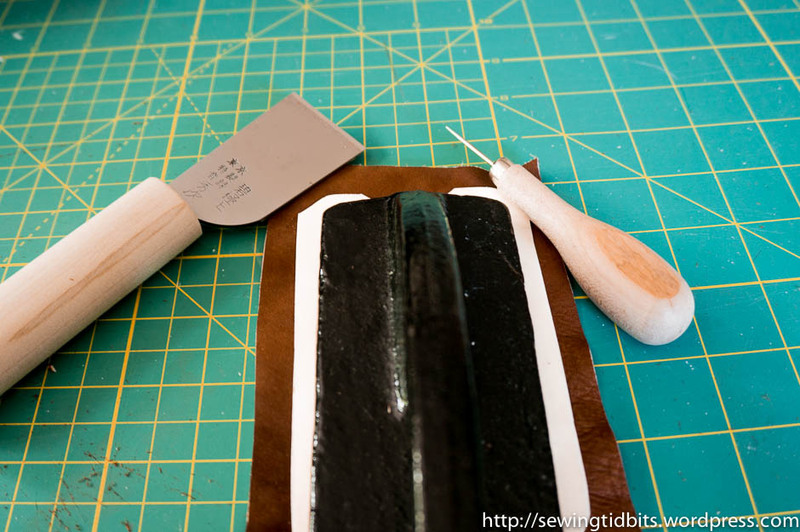 Have you tried hand sewing leather or do you avoid it completely? 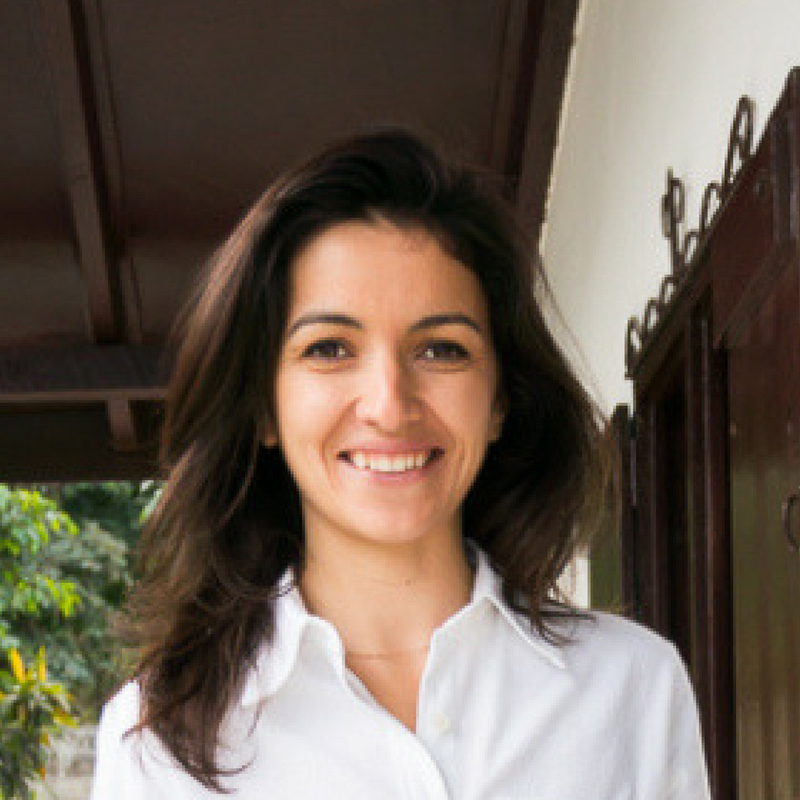 Share your tips! !